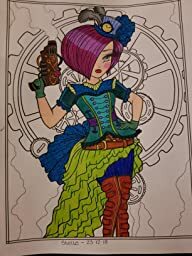 3 Responses to " Steampunk Darlings Coloring Book "
So, I absolutely love Hannah Lynn’s artwork, and this is my favourite so far, absolutely wonderful pictures. And even better, there is a woman in a wheelchair, which has made my day, as disabled people so often get ignored and forgotten, so happy to see representation in colouring books! Lovely pages to colour ð. Personally, I would have preferred the duplicate pages at the back of the book. I only want to colour one page of each design, but once I’ve done that and flick through the book, I’ll see a load of uncoloured pages ðððð making it look terrible. 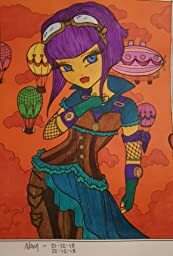 This is the reason for giving 4 stars, and if all Hannah Lynn’s colouring books are in this format, then I probably won’t purchase any others, as the duplicate pages need to be at the back of the book!!! This book is amazing! 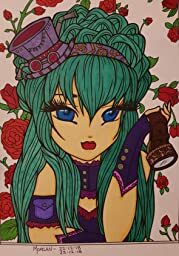 The detailing in the book is beautiful and Hannah Lynn’s style is gorgeous! It’s that nice I bout both the book and a PDF version! Ok, so it uses Createspace paper, but for some reason it feels slightly better than others. You can build colours on it well.